Register Log In wirral forums Forums Pets / Animals Get your cat neutered. Sick to death this last few weeks of hearing people cooing over their cat having had or expecting kittens. 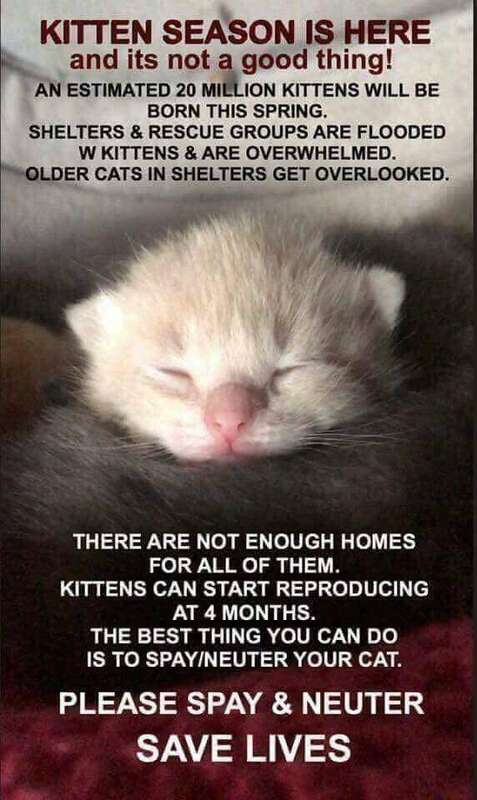 When will they get the message that we have TOO MANY cats and kittens in the country swamping rescues, and not enough good homes. If your allow your cat to breed , you take a share of the blame. Check out local Cats Protection they help with costs if needed. The PDSA are in Birkenhead Park this week in their mobile clinic giving out neutering vouchers and seeing sick pets. Not sure of date but think they're still there. Cats Protection will give out these as well. Another animal question if anyone can help. If the RSPCA are informed about a neglect case & they attend do they let the informant know the result of any investigation. On the subject of cats ,the cats protection were very helpful & paid for a stray female cat & her kittens to be neutered. They will always help & the only thing it cost was time . Apart from stopping the obvious it also protects against feline illnesses so a win win situation. They dont let you know as standard , you can ask to be informed, but they may or may not get back - think it depends on the type of case you're reporting and how busy they are etc.